Cat pose is a simple yoga pose. In fact, it’s one of the first poses that can be practiced with young children. Combining breathing with the proper execution of poses is very important to reap the benefits of yoga practice. Cat pose is ideal for introducing children to adequate breathing techniques; it is easy for them to match their inhale and exhale to the cat-like movements. Cat pose improves flexibility of the spine and stimulates the nervous system. Get down on your hands and knees (crawling position). Press the palms of your hands on the floor, making sure your shoulders are over your wrists and your knees are directly under your hips. Breathe in deeply, lift your head and tailbone towards the sky. Breathe out, tucking your head between your arms. Pull your hips in towards your belly button, rounding your back like a cat. Repeat a few times, matching your breathing to the cat’s inverted (inhale) and arched (exhale) back. Open, print, and laminate the following document: (Open cat pose). Show children the picture and let them see you doing cat pose. When should you use cat pose? Cat pose is perfect for the “active” period of any yoga session. 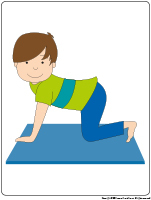 After the preparatory period, children can do cat pose to wake up their body and warm up their spine before moving on to more advanced poses. This pose increases children’s energy level. It is therefore ideal for helping them wake up after naptime or after a relaxing activity. Create a series of poses by alternating between cat pose and downward dog. Breathe in as you execute inverted cat pose. As you breathe out, transition into downward dog. 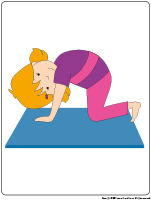 Create a sequence of poses with child’s pose. Breathe in as you do cat pose and breathe out as you transition into child’s pose.